I wandered up to St. Clair West Station today to check out the current signage situation. On the bus/streetcar platform level, I found a forest of signs pointing me to the eastbound bus stop inside of the station. Hurrah! Hurrah! An indoor connection. I was amazed at how few people got on with me, but all was soon revealed. The bus took a circuitous route to get itself eastbound on St. Clair: Leave by the west ramp (the east one is still closed for construction), south on Bathurst, northwest on Vaughan, east on St. Clair (bypassing the hordes waiting at the eastbound stop at least some of whom probably wanted to go to Yonge Street), and thence to the south entrance to the station. That’s where the big crowd of eastbound passengers was waiting. Didn’t they see all the signs? Well, no, they didn’t. People getting off a train come up to the mezzanine where there are NO signs telling them that the bus is back inside the station, and they trudge out to the south entrance as they have for months. Maybe when they finally get the east ramp open, someone will think to put up signs telling people NOT to go out the south exit because the next bus along will be the night bus. Meanwhile, the beginnings of overhead construction are underway. How they will get the work done by February 18th in this weather I do not know. But the real kicker is that the overhead hangers are incompatible with pantograph power collection. At least on Spadina we got modern overhead, but on our new, premier example of LRT, we get overhead that would be at home in the 1920s. Maybe we could save the expense and just run horsecars. Photo courtesy of Harold McMann. Oh, TTC signage! At York Mills, they are currently replacing one of the escalators (this will apparently take until JUNE!!!!). Anyway, there are some nice, new TTC signs which clearly state when the project began, when it will finish, and why it’s being done. Good job. 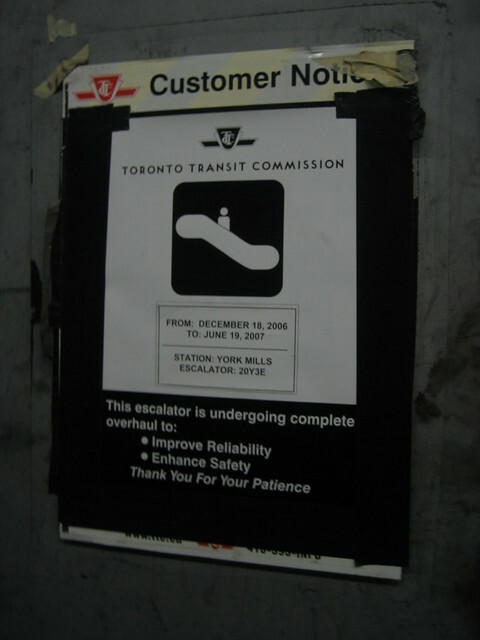 HOWEVER, there is also a sign from (I think) the removal of the moving sidewalk at Spadina, carefully explaining *that* construction project!!! What the heck? I think it’s there to cover up a window or something in the construction cabin, but still, that’s really bad. I’ll take a picture next time I’m there. June! That’s pretty fast. When did it start? Why, oh why is the TTC so dead set against pantographs? Even their experiment with it in the 1930’s wasn’t a total failure. Steve: Actually, I think this is a case of one part of the organization not knowing what another is doing. The people looking at new streetcars are planning for pantographs, but nobody seems to have told the folks designing the St. Clair “LRT”. I have found over the years that organizational incompetence often explains far more than conspiracy theories. The 1929-1930 experiment was with bow collectors, not pantographs, on the YONGE route (and later in York Township). For the purposes of overhead setup the difference is irrelevant. On May 21, 1929, 2502 (while still modified for radial operation over the LAKE SIMCOE line) was equipped with a Fischer bow current collector and experiments were conducted in Eglinton Yard (where no modifications to the overhead were required – see below). In August of 1929, five additional cars (2568-2578) were equipped with the collectors as well for a trial service on YONGE, following overhead modifications. Trial operation of bow collectors over the full YONGE route has been suggested by a few historians, however it is believed by most that the trial was confined to a lengthy section north of Eglinton where there were few overhead obstructions such as frogs. The only known in-service photo was also taken on that section. All bow collectors were removed in September, 1929, about a month after the trial began, and, with four additional collectors, were mounted on eleven ex Toronto Railway 1-man cars. Those cars then began operating a trial service on both the OAKWOOD and ROGERS routes out of St Clair Carhouse, once the overhead changes were made on those lines (but not on the overhead from the carhouse to the routes). The length of that period of operation is very unclear, but is thought to have been less than a year, probably much less, once winter operation was encountered. The only pantographs used by TTC were on trailer shunters. Overhead hangers in carhouse areas where they would operate (and not the entire yard) were turned upside down to clear the plates, and frogs were modified with skates. The shunters had originally been equipped with poles but that was found to be a nuisance as backing movements often resulted in wire damage when the pole was leading. The last shunters (and pantographs) were retired in 1954. I had the privilege of driving on St. Clair today from Mt. Pleasant to Scarlet Rd. The lane width at intersections near loading platforms reminds me of the lane width on one way streets in Hamilton, extremely narrow. It will be interesting watching a tractor with a 53 ft trailer making a right or a left onto St. Clair. Has the TTC given any consideration, probably not, into putting a west to south turn in at Bathurst rather than making that ridiculous turn at Vaughan Rd? Steve: No, not at all, even though the Vaughan Road trackage is a relic of the old Bathurst car and the loop that ran between Bathurst and Vaughan where the high-rise apartment stands today. The hangers (ears?) look like ones for curves and not straight overhead. It would probably be easy to fix but why not do it correctly at the start. Steve: I have the impression that the overhead crews use whatever is in stock and, yes, that hardware is normally seen on curves. What are they doing at loading platforms? Are they going to have a side pole with a long arm or are they going to use span wires? I could not tell from what was up yet. Also how long are the platforms? Will they hold at least 2 CLRV’s. Steve: Yes, the intent is to have a side pole across the two tracks holding the overhead. It’s a dumb design, but don’t get me started again on that aspect of the whole scheme. The TTC is implacable on the need for the new pole arrangement even though Spadina, which is wider, works just fine with span wires. Finally, are they thinking of going west from Gunn’s road? St Clair seems narrow until past Runnymede. Steve: Yes, there is an intent to study an alignment west of Gunn’s Loop although as you say the road is rather narrow. Narrow lane widths for cars and trailers? Try riding a bike! We have safety for TTC users, safety for motorists, safety for pedestrians, cyclists still play roadkill roulette on a public street. And to think that once early on in the consults the apparent #1 concern was better bicycling conditions. The amanglemated motoropolis is carrupt, or maybe just incompetent, tis true. Oh for $2 a litre gas!! It says the east ramp is closed for construction. Why is it then that the 33 Forest Hill bus is able to go up it, stay on the tracks until Spadina, and then turn left? Surely the bus could do something similar? Steve: Hmmmm. I do know that there was a temporary stop up on Tichester/Heath for the 33 to come to its route that way. Worth watching to see how long it takes for this to percolate through the system. I cannot speak for the overhead section, but I will give you my thoughts on the St. Clair overhead construction. First of all, I would have to believe that the overhead material was all ordered for the specific job. The overhead section certainly never had the material on hand to construct a new line, plus it takes many, many months for overhead material to arrive, after being ordered. The type of hanger being used is in fact called a “double curve hanger”, used mainly on curves but can be used as a straight line hanger, providing the span or attachments supporting the hanger are level with each other. Once this type of hanger is aligned and permanently fastened within the bracket arm assembly, it will remain that way, for a long period of time without need for adjusting, even taking a blow from a dewired pole. Also, although there are straight areas along the new right-of-way, there are many curves along the route and these double curve hangers with the attached trolley clamp (mechanical ear), will be held at the correct vertical plane for holding the tensioned trolley wire through these curves and thus giving the trolley shoe a smooth underrun and not causing destructive side wear on the trolley clamp. I don’t know at what stage the overhead section’s schedule for work done and work to do fits into the deadline of streetcar resumption on Feb 18, but on looking at the construction area I would say they are moving along very well. A good percentage of the single bracket arms are up, probably 60% of the spanning structure for the St. Clair Stn loop is up, some street spanning and poles must still be installed. The underground feeders and the trolley wire “feed risers” are being done by the contractor — some appears to be done and some feeder work still to do. The bracket arms that will hold up the EB and WB trolley wire have yet to go in, but they should present no problems — other cities have used that type of construction. After the overhead spanning and support structure is in place, I think many people would be surprised how quickly the trolley wire will be strung, tensioned and clamped in place. As for future pantograph use — my guess is that the bracket arms, that are now being installed, could be used to hold the proper hardware for supporting the staggered trolley wire alignment that would be required to get a even wear on the carbon inserts on the pantograph. Have you heard what the plans are for St. Clair for 2007? I saw that the contract to EarthTech (originally expiring Dec 2006) has been renewed until the end of 2008, but I have not seen any evidence of other activity. April 1, which is only 2 months away, appears to be the normal start of construction, but I can see no evidence of pre-work (Public meetings, rail welding etc.). Steve: It’s all politics. With the election, the City held off on holding any meetings regarding the next phase to avoid stirring the pot. It now looks like they will actually tackle the very west end of the route first in 2007 and save the part from Vaughan to somewhere west of Dufferin in 2008. This will allow extra time for detailed design in the very contentious part of the route. Of course, there’s a lot to debate west of Caledonia too. I expect that as in 2006, we won’t see any shovels in the ground until the summer. Also planned for this year are St. Clair West Station and Oakwood Loop. This will get all of the special work out of the way in 2007. With streetcars returned to the west portion and soon to be returned to the east portion, how long will they be running until they are taken off again, first for the west portion, then the whole route to do St. Clair West station. Steve: I suspect that they are there until at least June, but will check. PS: Why is St. Clair station in so bad shape? It was last retracked in 1995. Steve: I assume you mean St. Clair West. Those curves see a lot of service with every car in both directions going through the loop. All the same, I hope that when it’s rebuilt this year, they remember that it would be nice for it to be designed for ease of future maintenance and mechanically isolated from the station structure. I just discovered this site today and I’m absolutely overjoyed to find a forum by which commuters –passengers (let alone this “customer” crap the TTC call us on their audio system) can vent and get some real information that’s otherwise hard to find. What can we do? What do you recommend? Complaining isn’t enough — we need to take action. Why do we as citizens of the supposed best city in Canada allow ourselves to be dumped on continually in such a manner? Why don’t we demand something better for ourselves? Steve: A few points on this. First, until very recently, the TTC at a political level has done a poor job of really responding to complaints about the overall quality of its service. “Pizzazz” days do not make the Queen car run on anything vaguely resembling a reliable schedule. The received wisdom has been that we can’t fix anything, there’s no money, so we may as well not bother. I think the combined effect of the departure of the former Chief General Manager and the ascendence of Adam Giambrone as Chair of the TTC has already made a noticeable change at the TTC. Couple this with a rising wave of citizen activism, and there’s hope that (a) the TTC really will listen and (b) we really will have some effect. Also, the idea that somehow we can keep putting off making the system better until “next year” has finally worn thin, and there’s a real sense of trying to deliver some improvements soon. Having said all of that, there is no question that the St. Clair project had its problems both in mishandled presentation and in an attempt to overmanage public input. Couple that with a combination of legitimate issues and political grandstanding, and the reasonable folks were pushed to the sidelines. I am waiting to see what this year brings because we still don’t know which section of the line is going to be rebuilt for sure, let alone the design. Then there’s more public participation. A textbook example of how not to run a project. I noticed a slight problem on St. Clair yesterday… maybe not so slight given that streetcars are supposed to return in a week. The concrete barriers aren’t pretty but at least provide something to lean against and to stop the splash from passing cars on slushy days. But it’s a shame if residents of St. Clair are reintroduced to streetcar service that’s noticeably worse than what they had before. And I’d say they’re more likely to notice the lack of shelters than any improvement from privatizing the right-of-way. Do you know if the shelters are going to magically appear during the last week of overhead work? Or were they pushed to phase 2, apparently without realizing that while they’re not technically required to operate streetcar track, they are needed to operate a decent transit service? Steve: I noticed this myself on a trip along St. Clair on Saturday. If the experience on The Queensway is anything to go by, no, there will not be any shelters. Any TTC folk reading this blog who know differently might like to answer this question. The streetcars have now been traveling on the ROW for over a week now and everything appears to be working like clockwork. I have seen NONE of the traffic chaos that was common prior to construction in this area. Traffic flows freely, both transit and cars. All of the new left turn lanes are being well used. Even Avenue Rd. consistently clears within one light. So much for the gloom and doom. This raises an interesting possibility for the silence on 2007 construction plans concerning St. Clair. The TTC may have been so confident of the results of the Vaughan to Yonge section as a real life showpiece that they may have deliberately deferred any anouncements as a means of reducing opposition to the ROW. Steve: It’s more a case of having the definitive plans for what will be done this year.